What's cooking from the markets this week? I was out picking up tomatoes about three weeks ago at the Sunday market when I saw the happiest of sites -- a pile of pears. I asked the ‘Mater Man’ about the unexpected appearance of pears and learned that our odd weather this summer has led to early pears. That’s good news to me, as I love pears in lots of savory dinner dishes. If you consign this crisp fall fruit to no more than a snack, you are missing out a on an entire world of happiness. We’ll leave the pasta, panini and risotto for another day. For now I want to tell you how to use this fall’s pear harvest in a pizza to end all pizzas. Pear pizza. Seriously, give this a try and you’ll see. You’ll be hooked just like me. I crave this pizza year-round, and as soon as pears show up in the market, it’s pear pizza for dinner, heat from the oven in my tiny house be damned. The combination of caramelized red onions and pears on a crisp crust, smothered in golden provolone and mozzarella with just a bite of blue cheese, and the crunch of hazelnuts on top is deliriously good. 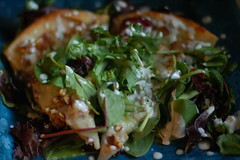 We like to shower it with baby greens and herbs, and drizzle (ok, cascade) it with homemade blue cheese dressing. Oh yeah. Buy a frozen pizza dough at Lotsa Pasta (unless your homemade dough is better – mine’s not) and thaw it. You’ll use half, but you can refreeze the other half after you cut it. If you’re in a hurry you can thaw the bag in hot water. Preheat oven to 450 Fahrenheit and heat a pizza stone or pan. You want your oven on for a good few minutes after it reaches temperature – a hot, hot, hot oven = a good pizza. Melt half a stick of butter in a pan over medium heat (don’t skimp). Add pears and red onion. Cook over medium high heat at least 10-12 minutes until it smells like heaven. Resist the urge to stir too often – the caramelization happens when the food remains in place and releases sugars. Roll out pizza dough and place on preheated pizza stone. Bake just the crust 4-5 minutes. Remove from oven, flip it, and top with caramelized pear and onion mixture, two cups mozzarella/provolone cheese and a sprinkle of blue cheese crumbles and handful of chopped hazelnuts. Bake until cheese bubbles and is lightly browned around the edges. Top if you wish with greens and serve with blue cheese dressing (recipe below). Now, devour a slice (or three) and tell me how much you love it. Mash buttermilk and blue cheese until it’s the consistency of cottage cheese.